Are You Ready For The Wedding Of Your Dreams? Your Ceremony is the heart of your Wedding and your Wedding Minister or Officiant is the heart of your Ceremony. You want everything to be perfect -- just as you envision it. That's what Rev Will is all about. Making your ceremony perfect is his mission and his profession. 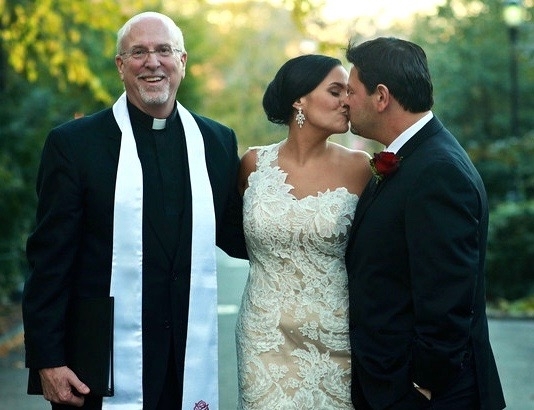 In just 10 years Rev Will has performed more than 800 wedding ceremonies both here and abroad with rave reviews all along the way. To see and hear Rev Will in action you might want to take a look at the Plaza Hotel Wedding video found here. What I Do and How I Do It are also explained. Ceremony Fees and Expenses are provided in detail as well as Kind Words that have been written about Rev Will's work. Finally, you can learn About Rev Will and access the Info Forms that will guide you and help Rev Will to determine his availability on your chosen date. Then he can connect directly with you and help make your wedding dreams come true! Once connected with Rev Will, he will create and perform your wedding ceremony with joy and engagement -- and a great sense of humor. More than 200 couples attest to the quality of his work with 5-Star Reviews for Excellence on The Knot and WeddingWire. "Unbelievably sweet and remarkable couples have engaged me to perform their Wedding Ceremony in varied locations from the base of the Christmas Tree at Rockefeller Center to the top of the Empire State Building through some of this country's finest wedding venues to a magnificent Dacha in Moscow, Russia. I've also performed destination weddings across the Caribbean, Mexico and Canada. And now I'm at home here in Charleston, South Carolina. Truly, nothing could be finer. I thank God for the love and joy that have accompanied me each step of the way. I am so blessed."